In an oversaturated market with low growth potential, profitability suffers. Breaking the gridlock and shifting to higher profit levels require changing the industry structure and ways of competing. Fierce competition drives margin erosion, leaving little room to step away from deep-rooted conventional rule of competition. Rigid ownership structures prevent change. Market consolidation combined with utilization improvement is a powerful profitability lever; expansion into a growing market drives growth. Key enablers include active ownership and decisive moves. In some cases an external agent is needed. In a saturated and stagnant market, companies often find themselves stuck in a gridlock. Competition is fierce, resulting in a bloody battle to gain marginal market share. No one dares to take long-term initiatives to shift to a more sustainable direction, as competitors try to take advantage of the situation to outcompete in a short term. This leads to continued low profitability, spiraling the industry down a vicious cycle. In this article, we discuss the case of the Korean corrugated packaging industry, and how the gridlock of this industry could be broken to create a healthier competitive ecosystem. Like many other long-standing “traditional” industries where innovation in product, technology or business model is less pronounced, Korean corrugated packaging industry is stuck in gridlock. 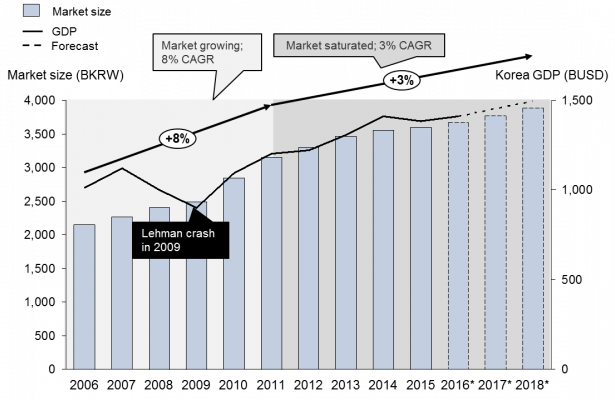 The market has drastically cooled down since 2011 and now expects around 3% growth in the next few years at par with stagnant GDP growth (figure 1). The industry holds considerable overcapacity which has persisted for many years (figure 2). As a result, profitability of industry players is depressing with the average operating profit at about 3%. The biggest players are not any better and many recorded loss in 2015 (figure 3). Figure 1. 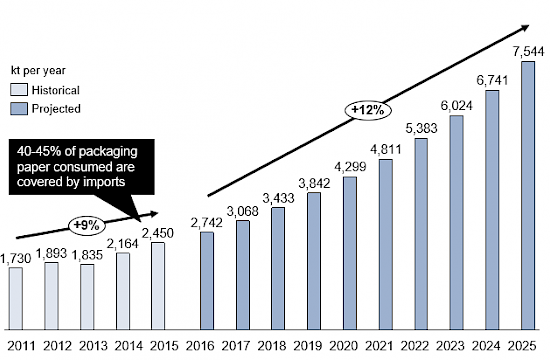 Korea corrugated packaging market size 2006-2018. Figure 2. Korea corrugated packaging production and idle capacity rate 2006-2020. Despite the excess capacity, top local companies continue to make incremental investments in capacity and asset quality, leading to significant idle rates (figure 4). There are two primary reasons. First, large companies continue to expand their operative presence as proximity to customers has been a key success factor for sales. Second, most of the large players are family-owned businesses in their second generation, hesitant to give up their position as they seek to maintain the legacy of the founding family member. In many cases the families’ current wealth today stems from other sources than the company (such as real estate), and thus they have the ability to maintain the “family heirloom” despite its poor profitability. As a result, competition is excessive with excruciating price competition. In many cases sales are tied to (one or a few) conglomerate customers, weakening the suppliers’ price bargaining power further. Figure 4. Utilization rate of Korean big 5 group companies (2015). Variable cost management is not easy either. For one, economies of scale and economies of scope are elusive due to the make-to-order nature of the business. In addition, the domestic price of the core raw material, recycled paper, has risen since late 2016 due to increased export to China (figure 5). China’s import has increased sharply mainly due to the government’s continued pressure on paper mills to reduce environmental impact, which resulted in decreased local production. On top of that Chinese government banned import of mixed paper, highly likely to increase import of ONP (old newspaper) and OCC (old corrugated container) from Korea. Figure 5. Change of OCC price in Korea and export to China. In a nutshell, Korean corrugated packaging companies are cornered with little room to improve their performance. To break out of this gridlock and grow, some players must break the status quo with bold strategic moves (potentially with the support of an external party), changing both the industry structure and how players compete. In advanced markets such as the US, big players have captured more market share in the packaging industry through active M&A in the last 10-20 years. Here the five largest companies account for over 80% of market share in the domestic corrugated packaging market, which has doubled from late 1980s. Compared to that, the five largest corrugated packaging companies in Korea combined take up less than 40% of total market share in the domestic market, while the rest is split among small box-composing players (figure 6). The relatively low industry concentration in Korea can be partially attributed to the fact that the five largest players are owned by families, whom are typically reluctant to let go of their long-standing family business. Figure 6. Comparison of corrugated package market share in US vs. Korea. Market consolidation has taken place in advanced markets since 1980s. Especially large global players from developed markets like International Paper (US) and Rengo Paper (Japan) have achieved continuous growth mainly through acquisitions, strengthening their presence in different geographic locations and businesses. International Paper (IP) is the largest paper company in the world as of 2015 with revenue of 22.4BUSD (more than 9 times bigger than that of a leading player in Korea). In 1899, IP was established from a merger of 17 pulp and paper mills, focusing on paper and pulp manufacturing. Over a century later, the main business is corrugated packaging including industrial (65% of total revenue) and consumer packaging (13%), while the importance of paper and pulp (22%) has decreased. As observed from figures 7 and 8, IP’s journey of shifting focus to corrugated packaging business occurred through numerous acquisitions and resulted in significant revenue growth. Figure 7. Selected acquisition history of International Paper. Figure 8. International Paper’s financial history of industrial packaging (corrugated packaging and containerboard). Rengo, the leading player for corrugated box as well as corrugated paperboard in Japan, has a long history of regional market expansion. Its journey started by establishing its Singapore office in 1989 in response to growing markets in Southeast Asia and China. Since then, Rengo has aggressively expanded into Asia, now running 21 companies in this region. More recently since 2013, Rengo has opted for acquiring local corrugated packaging players’ stakes through its joint-venture companies. By actively driving market consolidation, Rengo has established itself as a leading player in Asia. In parallel to this, Rengo has carried out multiple facility consolidations in Japan within the same or adjacent prefectures not only for its own facilities, but also for acquired facilities. 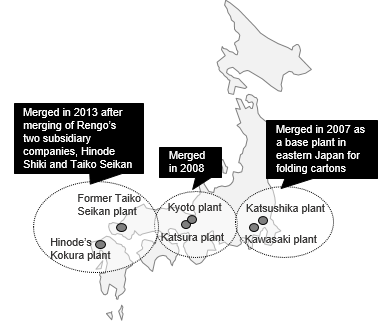 Examples include merger of Kokura plant and Kogyo plants previously owned by Taiko Seikan Co. after Rengo’s acquisition of Taiko Seikan as its subsidiary company (figure 9). These efforts have contributed to reducing excess capacity in Japan and improving utilization rate over the past decades (figure 10). Figure 9. Selected facility consolidations of Rengo in Japan. Figure 10. 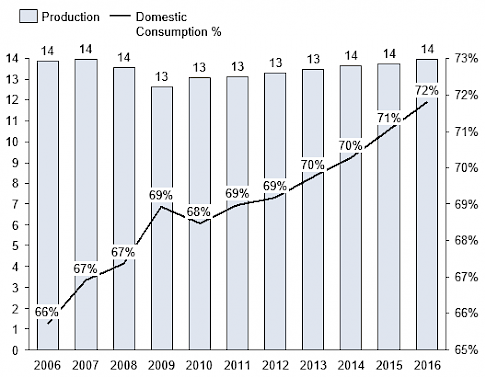 Production and consumption – Japan 2006-2016. As observed in both IP and Rengo cases, market consolidation can be a powerful lever for growth in a stagnant and saturated industry. This also supports profitability improvement by enhancing bargaining power over suppliers and customers. In Korea, combining offerings could have a similar effect, as the most companies have their specialized products. For example, Asia Paper, one of the major Korean corrugated paper and packaging companies, is well-known for their outer liners, whereas Daeyang Paper delivers most of corrugating medium consumed in the market. The Rengo case demonstrates the importance of operational restructuring. It is natural for big companies that are active in many regions to suffer from marginal profitability as their market matures due to inefficient dispersed operations. Without rigorous operational restructuring, market expansion would be a far-off target or at best a half-baked initiative where profitability issue escalates as the underlying manufacturing platform suffers from inefficiencies. The first mover would be able to steer the industry transformation. A practical challenge in Korea, however, is the rigid family ownership structure. This presents a barrier for taking initiative and also makes it hard to find target companies for potential acquisition. An external agent, such as an active owner private equity house, is probably needed. Globally, Asia has been the fastest-growing region for corrugated packaging market. 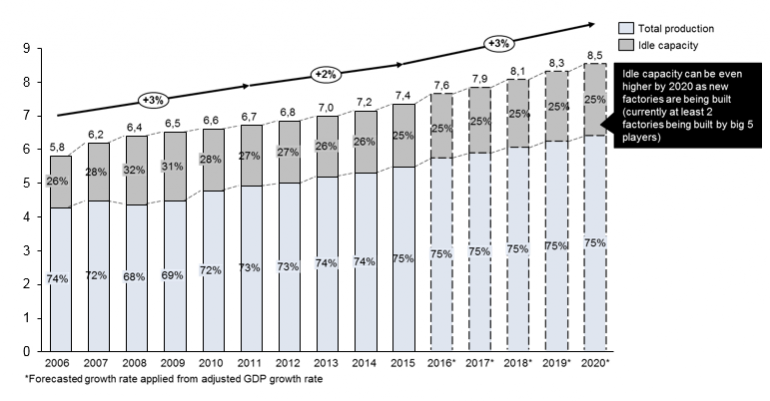 Growth in Southeast Asia has been particularly strong, especially in Vietnam, Indonesia and Philippines with annual growth rates ranging from 4 to 9% in the last 5-7 years. Vietnam, for example, is expected to grow at 12% every year for the next 10 years, fueled by rapidly growing packaging intensive industries such as shoes, textiles, and seafood (figure 11). In addition, the Vietnamese government has introduced benefits for foreign direct investment (FDI) for local production capacity development, such as tax breaks and preferential land rental. The main objective is to reduce high reliance on imports of packaging paper. Figure 11. 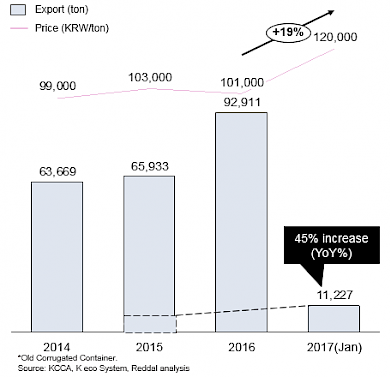 Demand forecast for corrugated paper consumption in Vietnam. Despite this rosy picture, expansion to the Southeast Asian markets is by no means an easy journey. In Vietnam the domestic production capacity is expected to grow at 9% annually by 2025 with leading Asian players crowding the market. Cheng Loong from Taiwan, for example, decided to invest in packaging paper production facilities with the capacity of one million tons/year in 2015 (the largest FDI project to-date of its kind). Other incumbent players include Cheng Yang from China, Lee & Man Paper from Hong Kong, SCG from Thailand and An Binh from Vietnam. Additional new greenfield investments will be rare, since most of the planned capacity by 2025 has been approved and projects completed or in motion. As the market matures, M&A deals, big FDI projects and efforts to establish national quality standards are likely to take off. This is where the government is driving the market as well, with their plan to eliminate small plants with capacity less than 10,000 tons/year by 2025 and encourage investment in plants with larger capacity. Figure 11. 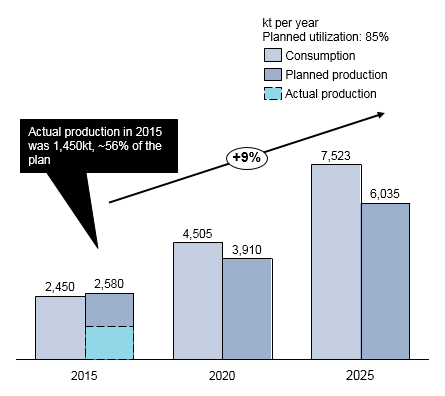 Capacity, production and consumption projection in Vietnam. In approaching fast-growing yet crowded markets like Vietnam, speed to market must be maintained, due to the growing competition from existing and already entering players. For Korean players with a strong base in the home market, a more suitable approach, therefore, could be M&A rather than greenfield investments. 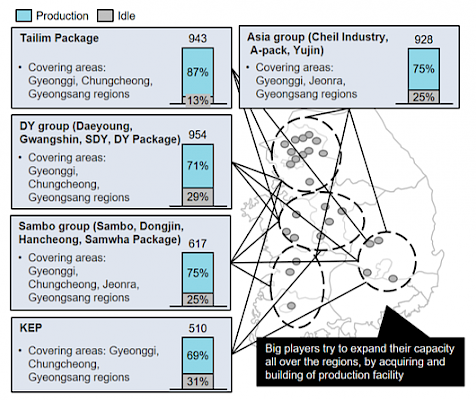 Korean players can narrow their focus to corrugated packaging manufacturers as most investments so far have been concentrated on packaging paper production. Final corrugated box market is known to be more fragmented in Vietnam than that of packaging paper market, providing more accessible M&A targets as well as upside for potential facility consolidation. The incumbent customer base of an acquired local company will also be an important asset. A newly entering company needs to determine which key buying factors of the target market to focus on. Three key buying factors can be considered for corrugated packaging industry; price, quality, and on-demand production. Price is commonly considered as the most influential buying factor as corrugated packages are often commoditized products with little differentiation. Quality can be a factor when a better product in terms of sturdiness, thinness, or environment-friendliness is provided for the same or better price. On-demand production refers to the ability to achieve on-time, on-quantity delivery or compliance to customized specifications. For example, if a Korean company specialized in high-quality inner liners enters to Vietnamese market, they can target foods and pharmaceutical industry as customers, who would appreciate the quality and specification capability. A skillful player can strategically adopt upcoming industry trends early on, leveraging insights from more developed markets such as lightweight packaging or environment-friendly production facilities. The Vietnamese government has recently taken a tighter grip on the environmental impact of the industry. An inspection at one of the paper plants raised serious concerns about noise pollution, dust and foul odor. Breaking through the gridlocked situation requires bold decisions to proactively drive the industry toward a new structure. This often entails major commitments, which pay off big in some scenarios but may cause large losses in others. Thus, top management needs to make sure they have the brainpower and muscle to conduct thorough analyses, lead the strategic decision-making to a conclusion, convert insights into solid execution plans and secure the financial resources to complete execution. It will be extremely challenging to drive the whole process through, overcoming the strong inertia stemming from deep-rooted rule of games of the industry. However, from this transformation, a new healthier industry paradigm can emerge for Korean packaging industry. Leveraging additional support from outside agents, such as an execution capable private equity firm, can be decisive for those who exit this process as winners. The authors want to thank the top management of several Korean packaging companies who contributed to this article through interviews, as well as Youngjin Bak for extensive field research. Hear more about the topic in our Reddal Talks video - Breaking out of a gridlocked industry.